I was supposed to have a guest blog this morning. Here I am sitting by Daddy's computer because Mom is busy on "ours" working on a blog for Dakota. Absolutely,I know what you mean dear friend! This is so wrong Cody !!!! Cat must come first !!!! CODY! What kind of deal is THAT!? Come join my Gypsy band and travel the world with me! Sorry you are having to wait. Ah, Cody... dat'z jus da way da freeze-dried sammun treet crumblez sumtimez, innit? (Good fhing we felinez noes a fhing or twoo about dis "waiting" stuff, eh?) But still... pfffffffft. @GlamKitty but don't you see my "mean" face? MOL! I think catchin' some zzzz's is a great idea and I am gonna do that right now! @Old Kitty LOL!!! Actually this time it isn't Mum's fault! That's what ya get when you try to help someone out! xoxoxo to you and Charlie! @Artemisia that's ok! It allows me to rest my paws MOL! Sighs. Hoomins. So very unreliable! But we have to say, that is a great pic of you, Cody. @The Whiskeratti "sigh" I agree! thanks so much about the pic!! Have a fun day! What a good boy you are Cody to be so patient. We could never just wait for anyone. We hope Dad comes soon. If not, just teleport over here. Lots going on here. take care. What if YOU go on strike for a few days. That will teach them beans to behave. I think you deserve a bagfull of treats for all that waiting. purrr...meow! Waiting is almost the worst thing...waiting to wait is a bit tougher! @Fisher UGH! I am sorry you are playing the waiting game too! I say we stop waiting! @Brian "waiting to wait" PURRFECT! @Cat-from-Sydney actually I am eating treats AS WE SPEAK! MOL! It's the official Monday Morning Patience test - will you pass? There may be tasty rewards if you do! You are very cute, Cody. Your expression says it all, Cody! I am glad I'm not the one on your bad side! Oh Cody, that is SO not cool. But, at least you look totally cool in this photo. Uh-oh, did somebody miss a deadline? That sort of thing makes my human (a former magazine editor) tear her hair out! BTW, tell your human thanks for the RT on Twitter today! Not to worry... We'll be back tomorrow. Very cute post! Oh, our felines can read and write, can't they?! ha ha ha...Mommy says you are just like Mike Myers and Coffee Talk! Topic: How hairballs are neither hairy nor balls...discuss! Geez sounds like Dakota is trying to steal your blogging thunder! @Stacy and Ellie, nope! Read above! @Mariette yes we can! Much love to you too Mariette!!! We love you! @Max thanks for not giving up on us pal! @Sparkle, YEP, YOU "get it!!" Mom used to work at a newspaper in advertising for over 20 years so she soooo understands! She is BEYOND "deadline driven!" What happened was a guest blogger was supposed to send in their piece...they never did. 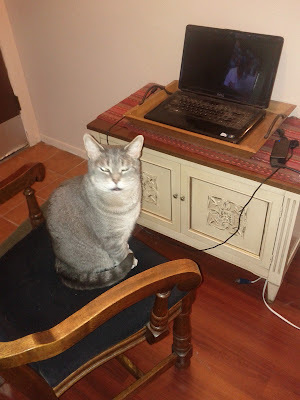 So Mom was going nuts and decided to work on Dakota's blog with the hopes that it would come when she was finished. It never came. You are welcome about the RT! Mom LOVED THAT VIDEO! @Weetzie thanks my friend!!!! I am one cool dude! @Benny and Lily now THAT sounds like FUN! Boy, Your mom owes you big time cody. We feel that way on Mondays too! MOL! Poor creature!!!! Lovely baby! So sorry you had to wait Cody....speaking of waiting you should be checking the mail in the next week or so! Mom was super slow with prizes BOL its almost October. Mondays are great days to wait! I know the feeling. Sometimes it's like pulling teeth to get a clever word out of Glogirly. Thank COD she has ME for inspiration. Cody darling you come first! Get your mummy back to her real job: serving you! @Mario it wasn't Mom's fault! It was the guest blogger! Mom even emailed them and told them if they got it to them later today she would post it but nada! Oh well, that's what you get when you try to help someone out! @Cats of Wildcat Woods, noooo they aren't! @Erika and Blair, you know what? I had totally forgotten! MOL! No worries! @Simba, yep tomorrow is a new day! Sheesh! Cody, that's just not fair that you aren't getting the help you need!! Humans are just so....so....so UNSATISFACTORY, Cody. Sigh. @Spitty to say the least! LOL. Such a disapproving look! Cody, you sure are handsome!